Meteorites are slowly becoming a popular stone option for people who are interested in unique and stylish ring settings. Customers value these rings for their natural beauty and grace, as there are no other rings that are truly like them. Meteorite wedding rings are composed of the Gibeon meteorite, which is a fine octahedrite iron meteorite that flamed up in the atmosphere and landed in modern day Namibia. This meteorite is unique in that it is composed of several defining alloys and elements, most notably iron and nickel. It was originally derived from an extinct planet's core several billions of years ago, and it features distinct crystalline pattern that can only be found in meteorites. Caring for these unique rings can be simple when you assemble all of the right tools and know what to expect. To begin, it is important to avoid wearing these rings if you have a nickel allergy. Nickel is a large component of meteorites and individuals who suffer from the allergy may experience uncomfortably symptoms when they wear the rings. 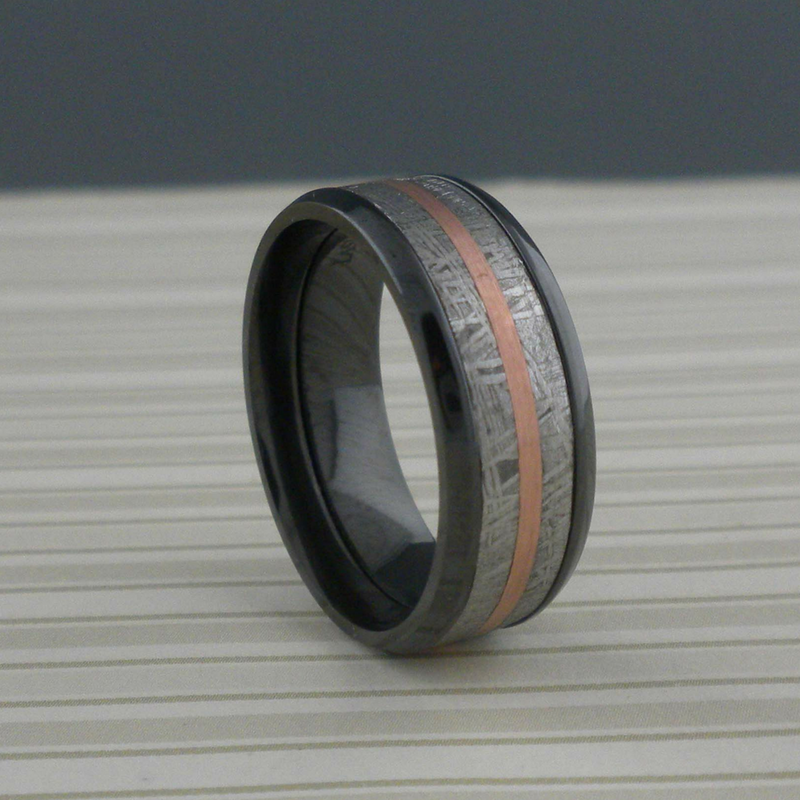 These wedding rings are usually very durable, which means that they can stand the wear and tear of daily use. However, individuals should treat their rings like any other articles of fine jewelry. Day to day preventative care can go a long way in making sure that the rings last as long as the wearers want them to. Individuals should be sure to avoid doing yard work, automotive work, construction work and any other activities that may involve coming into contact with corrosive and abrasive materials. Extended periods of time in any dangerous environment should be avoided whenever possible. Individuals should also be sure to pay attention to their hands when they wear their rings. Wearers should be sure to avoid hitting their rings against hard objects, as the force can result in denting and scratching. Meteorite rings tend to be rust-resistant naturally, so wearers do not have to worry about taking the rings off when they wash their hands. While a relatively small degree of exposure to water can be acceptable, wearers should avoid excessive moisture whenever possible. Rust resistance does not necessarily mean that the ring is entirely impervious to rust. Much like with any article of fine jewelry, the rings should never be exposed to bleach, chlorides, acids, household cleaners, or any other substances that are too extreme on the pH scale. The ring should never be worn in saltwater, hot tubs or swimming pool water as well. Maintenance can be as simple as applying a little bit of oil to the surface of the ring to actively prevent the iron components from rusting. If the meteorite ring does end up rusting, users can clear it up by dipping an old toothbrush in CLR cleaner and using it to scrub the rust off. Sometimes the patterns on the surface of the meteorite may start to wear away as the rings age. Users can have their rings etched again when this happens, as it is a normal part of wearing the jewelry.